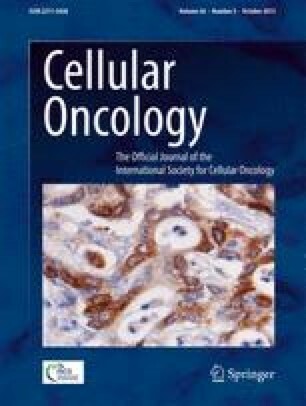 The aim of this study was to examine the expression of established stem cell markers in ascites and tumor tissue obtained from ovarian cancer patients. Mononuclear cells present in ascites were collected by density gradient centrifugation. Intracellular flowcytometry was used to assess the putative presence of stem cell markers. RT-PCR was used to detect full length Oct4A, a splice variant Oct4B, implicated in glioma and breast cancer, Oct4 pseudogenes and c-Myc. Genes were cloned and sequenced to determine putative mutations. Confocal laser scanning microscopy was performed to localize the markers in ascites cells as well as in tumor tissue. Material from carcinomas other than epithelial ovarian carcinoma served as control. A small quantity of cells in ascites and in tumor tissue of ovarian cancer patients was detected that expresses c-Myc, Oct4A and Nanog. Besides Oct4A, present in the nucleus, also the cytoplasmic resident Oct4B splice variant was detected. Remarkably, c-Myc was found partially in the cytoplasm. Since no mutations in c-Myc were found that could explain the cytoplasmic localization, we hypothesize that this is due an IL-6 induced c-Myc shuttle factor. The expression of stem cell genes was detected in a small proportion of tumor cells present in ascites as well as in tumor tissue. IL-6 plays an important role in the induction of c-Myc. This work was supported by a grant from the Dutch government to the Netherlands Institute for Regenerative Medicine (NIRM, grant No. FES0908). All authors declare no financial disclosures.